A small cluster of islands in the Atlantic Sea, for years largely ignored by international tourists, has burst on to the global stage; it’s magical landscapes quickly making it the next place to go for those that feel Iceland has gone too far. 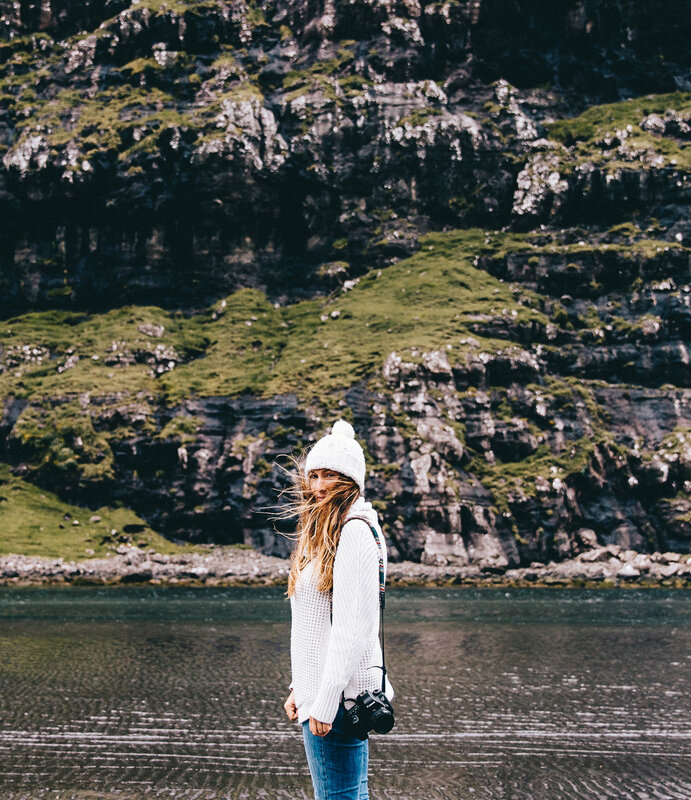 We recently spent seven wonderful summer days on road trip criss-crossing the Faroes and in this post, we’re sharing our own one week Faroe Islands itinerary (with a day-by-day breakdown), alongside our advice on how best to experience the islands, recommendations on where to stay, plus potential additions or tweaks to the itinerary we would recommend to help future visitors to plan the very best Faroe Islands road trip! Is a Faroe Islands Road Trip The Best Option? Over seven nights and eight days, we drove along winding single-track roads, through dark tunnels blasted into rock or under the sea, past many many sheep, towards gorgeous little villages, on dramatic blind hairpins, and always with an epic Faroese view just ahead of us or in the rear-view mirror - we absolutely loved it. The Faroe Islands, it turns out, are perfectly set-up for a road trip and the perfect setting for an adventure by car - but this can come as a surprise to people. The main islands are incredibly well-connected by a series of tunnels and bridges, the road conditions are pretty great, and the distances each day are manageable (with a drive time of only two hours from east to west). Having your own rental car also allows you to venture towards some of the most remote spots within a destination which is already, well, pretty remote. As we outlined in our ‘Faroe Islands Travel Budget’ post however, a road trip ain’t cheap, with one week’s car rental averaging out at £500+ ($650 / €565) before fuel costs. The Islands are not a destination for budget travellers in general due to the price of accommodation and meals, so it’s important to understand this fully before you set your heart on visiting. Public transport exists in the Faroes, but the limited schedule and coverage will notably restrict your ability to travel across the islands in a week or less. This means that there is no doubt in our minds that a road trip (or cycle trip) is the best way to experience and travel the Faroe Islands. 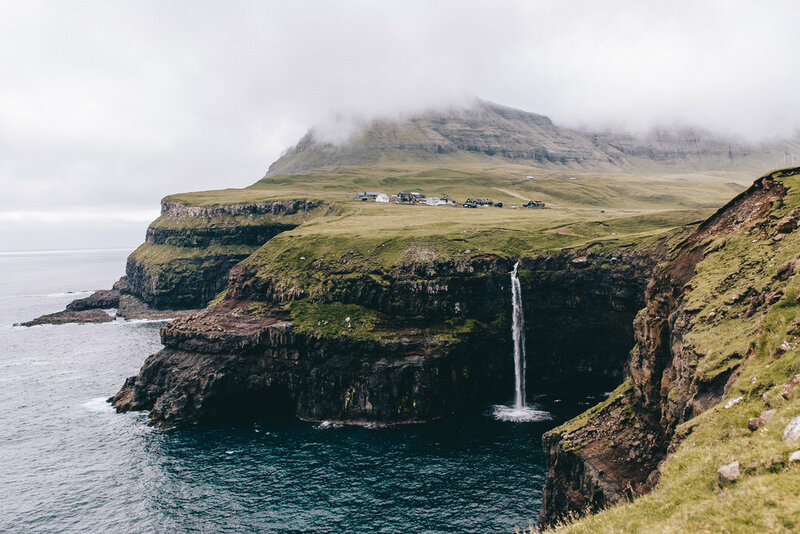 If you are reading this post to help shape your own itinerary, but don’t plan on taking a road trip or prefer local tours, then we do recommend that you continue reading but you may also like to check out our ‘10 Things to See in the Faroe Islands’ post (published soon, we promise!) for some additional inspiration. When planning a road trip route and travel itinerary in the Faroe Islands, it is best to first split the islands into their component parts. The larger islands of Vagar and Streymoy in the west, and Eysturoy in the middle, will feature on every visitor’s itinerary due to their accessibility and attractions. Travellers with more time, or looking to do the famous lighthouse hike, will also include one or two from the smaller cluster we call the ‘Northern Islands’ (composed of Kalsoy, Kunoy, Bordoy, and Vidoy for the purposes of this post). Following our itinerary, you will visit each of the above in a route which doesn’t involve too much ‘doubling back’ on yourself or rushing, whilst it limits time in Torshavn - the capital city - to just three nights; if you are road tripping for three to four days then you will have to either go at a much quicker pace than we did (not recommended) or simply remove some locations to make a more manageable and desirable route that still allows you to have a wonderful Faroese experience. Vagar Airport is the only airport on the Faroe Islands, and so it is inevitable that the almost all trips will start out here; it is also the best location to pick up a rental car (which you 100% need to book in advance - read more here). Our flight from Edinburgh arrived in the late afternoon, meaning we had little time to explore the island that day. Should your flight arrive in the morning or early afternoon however, you may well be able to start your road trip straight away and potentially even squeeze in a hike! Where We Stayed | We based ourselves at Hotel Vagar for the first night, a hotel which literally couldn’t be any closer to the airport. Whilst we opted to stay close to the airport for our first night, many instead choose to head straight to Torshavn - often using it as a base for their entire road trip. We considered this when planning our route but dismissed it as the independence of a road trip is, for us, an opportunity to stay outside of cities, spread the positive impact of tourism more evenly across a destination, and also to spend nights in remote or lesser-visited locations. Giljanes Hostel | With dorms, camping sites, plus a few basic private rooms, this is an affordable, clean, comfortable and well-located option close to the airport - check prices and availability. Guesthouse Hugo | Next to the sea, this is a welcoming bed & breakfast run by Maria and Kent. It only has 2 single rooms and 2 doubles however, so does have limited availability. Check prices and availability here. Our original itinerary had us visiting Mykines on our first full day in the Faroes. Unfortunately however, the weather Gods had other ideas, and this was not to be (read our guide to Mykines to understand how common this is). Instead, we threw on our hiking boots and set off on a hike towards the village of Gasadalur. This tiny village hidden by the sea was once only accessible to those willing to hike up and over a mountain, along the old Postman’s trail - so that’s the way we went (instead of simply driving through the new tunnel that now connects it to the rest of Vagar). Reaching the impressive Mulafossur after a few hours sweating makes the epic views even more impressive! To learn more about the hike, or plan your own, see our guide. After lunch, we zipped along the empty roads to hike the lake at Trælanípan. Yes, that famous Instagram lake is actually only a five minute drive from the airport (and you may be fortunate enough to get a stunning view of it on the flight into Vagar - book that window seat!). It’s a very manageable 3 kms walk to the main viewpoint where the lake meets the sea but trust us, there’s more beautiful scenery here to savour slowly than simply rushing straight up the hill. 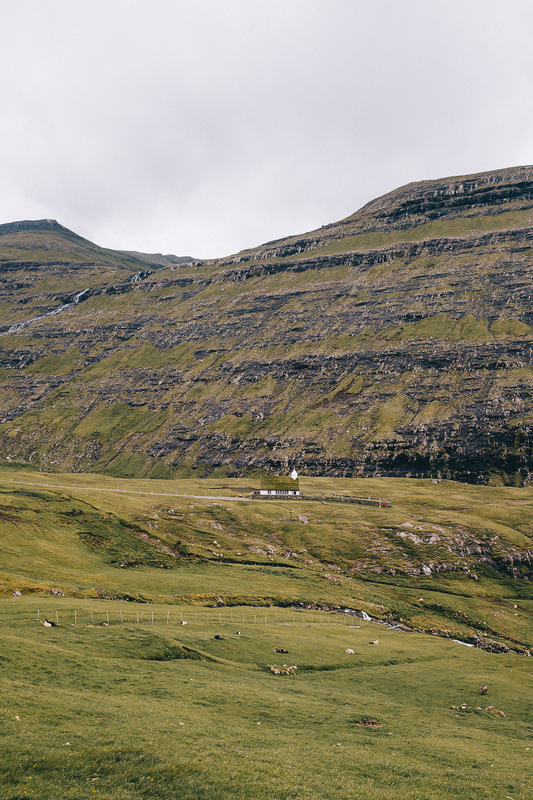 If we arriving on the Faroe Island in the early morning or afternoon, then this is hike we’d opt to do on Day One. We’re in the process of putting together a guide to this very place, so stay tuned. A short drive from Trælanípan car park, and a sensible next stop, is the photogenic Trøllkonufingur. Legend has it is that this rock face is the remnants of a witch who tried to throw the Faroes to Iceland. The road up to Trøllkonufingur is a little bumpy at times, but you can easily park at the top and take the short walk. Tip | Check for ferry and helicopter cancellations to Mykines online, or ask your hotel reception for an update in the evening / early morning. Note that the ferry to Mykines leaves from Sørvágur, a small town on the island of Vagar. Due to the likelihood of a cancellation, we recommend you have an idea about what your own ‘plan B’ will be, just in case! Where We Stayed | At the end of Day Two, we drove along the sub-sea tunnel towards Torshavn for a night at Hotel Føroyar, a large, modern grass-roof building overlooking the city and the sea below. As Torshavn has most of the eating out and accommodation options in the Faroes, as well as most of the people, it’s likely that you will spend at least 1-2 nights in the city; we’ve created this short Torshavn City Guide with ideas on the best things to do, where to stay and our favourite restaurants for every budget. Awaking on our third day to dense fog, we indulged in a long breakfast and headed out to explore the island of Streymoy, the largest of the Faroes. From Torshavn, we snaked our way along a high and winding single track road to the picturesque village of Tjørnuvík, at the very north of the island. Tiny and quaint with a population of around 60, it’s definitely worth adding to your list of ‘cute Faroese villages you’ve got to visit’. There’s a pretty beach, a small car park and, unusually for the Faroes, a coffee shop. Top tip | The best photograph of Tjørnuvík is from the road before you enter the village, whilst you’re still up high. Having somehow missed the rather impressive Fossá waterfall on our way to Tjørnuvík (we blame the sheep just dying to have their photo taken on the opposite side of the road), we made a point to pull on to the right hand side to explore a little. Reminiscent of waterfalls in Iceland, you can clamber relatively close to the water without causing any damage to yourself, or the surroundings. Note that there is only space for a handful of cars to park safely here in the spaces provided and that the rocks are slippery to traverse. After this, we continued on to Saksun, along perhaps one of our favourite stretches of road in the Faroes. Wide open spaces flanked by imposing mountains, the odd house dotted across the landscape and not another car in sight; the drive to Saksun is breathtakingly beautiful, and will be so whatever the weather conditions - take it slowly and savour it. The village itself is really just a collection of a few houses, huts, and a church, but this belies the majestic location of it all and the beauty of the traditional Faroese homes nestled amongst the grass. There are three parking locations in Saksun (these can fill up in high season), and your best bet is to go right as you approach the town which will bring you to the largest car park. Just across the road from the car park is a little museum and cafe run by a local farmer and his partner - coffee stop opportunities are few and far between in the Faroes and we will long remember sitting in this cosy little old farmhouse, away from the wind chatting with the owner about how tourism is impacting the Faroes (both for the good and the bad). In the village, you will be able to visit the beautiful white church overlooking the water, and also take a short, picturesque walk down to the beach (the potential of this will ebb and flow according to the tide). The access point for the walk is easily found by taking the left fork as you approach Saksun, or you can just walk to it from the car park mentioned above. The last port of call for our day of Steymoy exploration was Kirkjubøur, the southernmost village on the island. Tip: When visiting these small communities in the Faroes, be respectful and considerate of the space and privacy of those who call it home. In Saksun in particular there is a real problem with visitors trespassing to take photos of a certain house from a certain angle and this is not welcomed by the owners (nor should it be). Be a responsible traveller and remember that no photo is worth ruining this place for the people who live here, or the people who visit in future. Where We Stayed: Hotel Føroyar in Torshavn. Whilst many, even on a longer trip like ours, base themselves in Torshavn, we felt it was important to spend a few nights in the Northern Isles. Our plans had initially included the beautiful four hour hike of Villingardalsfjall but, in true Faroese style, the weather again intervened, so we had to act like Ross from Friends and pivot. Instead, we headed over the short bridge that connects Streymoy and Esturoy, towards Slættaratindur, the highest mountain in the Faroes. This high and winding mountain pass road (watch out for the sheep!) brings you along beautiful scenery, including a viewpoint over one of the fantastic Faroese football pitches and a lovely secluded spot with binoculars looking out at the ‘Witch and Giant’ rock formations. Depending on your preferences, after passing the blustery Slættaratindur hike start point car park, you can continue on to the pretty village of Gjógv on the north-eastern tip on the island, or take the sharp right curve (be cautious as it’s a blind turn) down to the beautiful valley village of Funningur. The easiest option is to continue on to Gjógv first, and then double back and down to Funningur. Both are delightful, but Gjógv was the first place were we felt that the balance was slowly being tipped from peaceful village into tourist stop. Tip: If, when you’re done with your day of exploring you need to warm up, be sure to pop by Fríða Kaffihús, a lovely little coffee shop in the town of Klaksvik. It was probably the most expensive chai latte we’ll ever consume, but damn it was good! (also one of the few places we found non-dairy milk). An early morning start saw us driving back to Klaksvik (we may or may not have had another cup of coffee at Fríða Kaffihús….) to catch the 10 a.m. ferry to the island of Kalsoy. 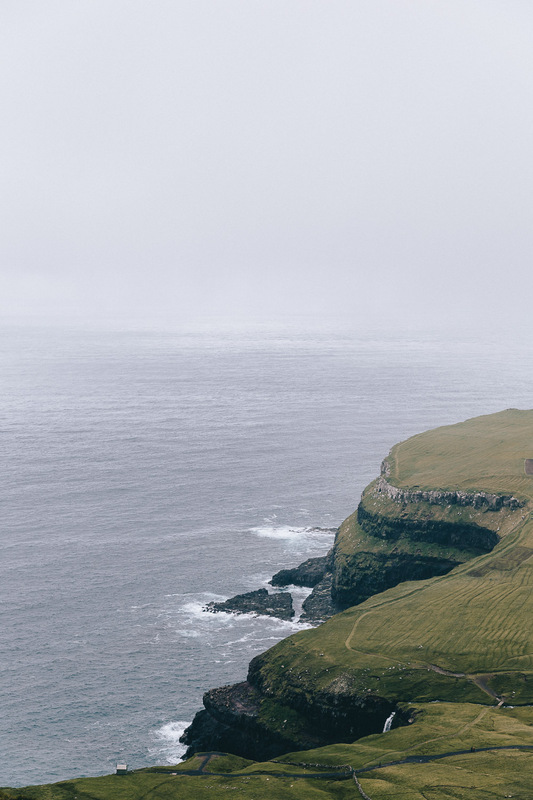 Kalsoy, home to only 60 or so people, is also the site of one of the most popular day trips on the Faroe Islands; the Kallur Lighthouse Hike. This short two-hour round trip hike provides epic views over the ocean, a little work-out for bodies that may have spent too long sitting in a car seat. We’ve written an entire post on this wonderful day trip, so be sure to hop on over to help plan your time on Kalsoy. Returning back to Bordoy to decent weather and light in the late afternoon, we continued our exploration of the Northern Islands, first heading over to the island of Vidoy, and it’s quaint coastal village of Vidareidi, the the most northern settlement of the Faroes. This small town is most well-known for its photogenic church, but also provides fantastic views of Villingardalsfjall. Vidoy is small, even by Faroes standards, and driving the route around its coast should take no longer than an hour (including a few stops for photos). Before heading back to our summerhouse for the night, we we drove north from Norðdepil, along one of the many ‘Buttercup Routes’, to the abandoned village of Múli. With no permanent residents for the last twenty years, and only a couple of holiday homes, it is bewilderingly quiet and provides those who venture down its bumpy roads with time to simply sit, and watch, listen and enjoy, a stillness that is rare these days. Tip: With the super long days that exist in the summer on the Faroes, it can be easy to ignore the clock and rely on the light as a guide to when you should go to bed. This is wonderful for fitting in as much as possible to your waking days, but as most itineraries here involve a lot of ‘doing’, be sure to have enough rest - as difficult as it is to go to sleep when it’s still light out! Where We Stayed: A large one bedroom apartment (called ‘Norðvist’) with fantastic views of the harbour, in Norðdepil. With a lot of driving under our belts, and a fair bit of hiking (although not as much as hoped), we took the opportunity to rest up in Torshavn and properly explore one of the the smallest capital cities in the world. A full day here is plenty of time to discover the city’s charm, and get lost in its little streets - but for some guidance, check out our guide to Torshavn. As culinary highlights can be a little limited elsewhere in the Faroes, a little time in the capital provides ample opportunity to indulge in one of the country’s best restaurants. Where We Stayed: This delightful Airbnb in a wonderfully cosy grassroof house (we christened it the ‘Hobbit house’). Home of one of the Faroes’ famous lighthouses and oodles of puffins, Mykines is the most westerly island and only accessible via a morning ferry from Vagar or a helicopter ride (yep, cheap helicopter rides are a big thing in the Faroes). Top of the list of almost everyone heading to the Faroes, daily visits to Mykines are limited due to their inaccessibility and to preserve the wildlife, so it’s necessary to book your ticket in advance. However, before you rush to book, it is worth knowing that Mykines receives notoriously bad weather and so the transport connections are often cancelled at short notice. We actually fell victim to this during our week in the Faroes, but we had thankfully factored this into our route planning. As we mentioned, it is necessary to expect your trip to Mykines to be cancelled. As this proved to be the case for us, we did our best to secure a spot on a boat trip later in the week - our luck was against us as there were no spaces available until a special second boat was chartered to meet the demand created from so many cancellations. You can read about our day trip to Mykines, and essentials for planning your own, in this post. Where We Stayed | A second night in our ‘Hobbit House’ in Torshavn. Depending on your flight time, your last day will really be nothing more than a ‘pick up day’; a chance to quickly visit any easily accessible sites that you missed during your first loop of the islands.. For us, we revisited a few spots to take some photos as the weather was improved from earlier on in the week, but if you fly in the afternoon or evening, it would be perfectly possible to squeeze in a short hike too!